Transparency Market Research delivers key insights on the plastic strapping materials Market in its published report, titled “Global Plastic Strapping Materials Market: Industry Analysis and Opportunity Assessment, 2018–2026”. 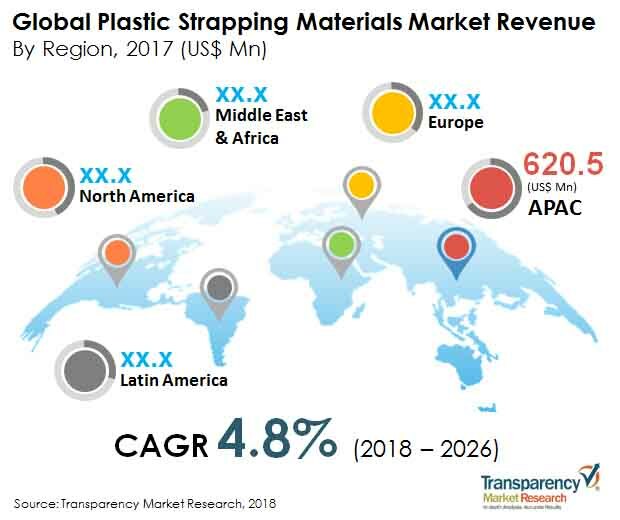 In terms of revenue, the global plastic strapping materials market is estimated to expand at a CAGR of 4.8% over the forecast period, owing to numerous factors, about which TMR offers thorough insights and forecasts in this report. The plastic strapping materials or bands are used as unitizing materials for bundling the products such as corrugated boxes, pallets and skids. Plastic strapping materials are made up of polyester, composite polymers or polypropylene. The plastic strapping materials find application in various industries such as building and construction, glass, food and beverages, agricultural, textile and others. The global market for plastic strapping materials is segmented by material, application and end use. The demand for plastic strapping materials market increases due to need of handling and shipping products efficiently and economically. Generally, the steel strapping is used for the heavy products as unitizers in the industry, but after innovation and introduction of high tensile strength in plastic strapping materials, consumers are attracted toward the plastic strapping materials. The composite strapping is made up of polyester and polypropylene, and has attracted the end-user industries for heavy load applications due to its high tenacity. Logistics and transportation industry is the emerging consumer for plastic strapping materials due to its easy handling. Plastic strapping materials market is growing due to highly innovative and compatible products available for manual and machine handling. Cotton baling and textile industry uses plastic strapping materials owing to provide securement and easy bundling of products. Automotive and consumer electronics use plastic strapping materials for conveying bundling equipment and parts. The plastic strapping materials market players offer economical and wide range of products which drives the market growth. The plastic strapping materials are characterized in the global market on the basis of load unitizing and carrying capacity. This report assesses trends driving the growth of each market segment on the global level and offers potential takeaways that prove substantially useful for other potential market entrants in the plastic strapping materials market. The North America plastic strapping materials market includes country level analysis for the U.S. and Canada. The U.S. plastic strapping materials market is expected to grow at a CAGR of 2.5% during the forecast period in which food and beverages segment is estimated to account for the largest market share by end-use type in the region. The Latin America plastic strapping materials market include country-level analysis for Brazil, Mexico, Argentina and rest of Latin America. The Mexico plastic strapping materials market is anticipated to expand at the highest pace during the forecast period in the Latin America region. The Europe plastic strapping materials market includes country-level analysis for Germany, Italy, U.K., France, Spain, Benelux, Nordic, Russia, Poland and Rest of Europe. Germany accounts for the highest market share in the Europe plastic strapping materials market. The Asia Pacific (APAC) plastic strapping materials market includes country-level analysis for China, India, ASEAN, Japan, Australia & New Zealand and Rest of APAC. The APAC plastic strapping materials market represent most lucrative geographic region wherein China represent substantial incremental opportunity and market share during the forecast period. The APAC plastic strapping materials market is expected to expand at the highest pace during the forecast period among all the geographic segments. The Middle East and Africa (MEA) plastic strapping materials market include country-level analysis for GCC, South Africa, North Africa and Rest of MEA. High growth in the manufacturing, transport and logistics sector have driven the Turkey Plastic strapping materials market. In this report, we have discussed individual strategies followed by these companies in terms of enhancing their product portfolio, creating new marketing techniques, mergers and acquisitions. The ‘Competitive Landscape’ is included to provide report audiences with a dashboard view and company share collectively. Key players operating in the global market for plastic strapping materials are Samuel, Son & Co., Limited, SIGNODE INDUSTRIAL GROUP, Scientex Berhad, Teufelberger Holding AG, M. J. Maillis group, Hangzhou Youngsun Intelligent Equipment Co Ltd, FROMM Holding AG, GRANITOL akciová spole?nost and Messersi' Packaging Srl Dynaric Inc.